The number “nine” has a great symbolic richness. On the one hand, it is derived from the Trinitarian and Divine number “three” – being “three times three”. On the other hand, “nine” is a number of imperfection because it is one lacking from “ten”. In the Scriptures, St. Jerome tells us, “the number nine is indicative of suffering and grief.” (Commentary in Ezekiel, vii.24) We recall that the good shepherd leaves the ninety-nine sheep to go after the one that was lost. Further, Abram was ninety-nine years old when circumcised and, entering into the covenant with God, received his new name of Abraham. It is worth noting that, unlike the numbers “three” and “ten” (and “twelve”, etc. ), the Jews did not have a great regard for the number “nine”. Indeed, the practice of a nine-day novena of prayers is not of Jewish origin, but finds parallel only in pagan practices. It seems that, although the first “novena” was carried out by the Apostles (together with the Blessed Virgin Mary) in an upper-room in Jerusalem during the nine days between the Ascension and Pentecost, the Christian faithful first began to keep “novenas” not in preparation for Pentecost, but rather before Christmas. By the seventh century, particularly in Spain and France, the faithful kept of a nine-day novena of preparation before the Solemnity of Christmas. It is clear that these nine days of prayer were symbolic of the nine months which our Savior spent in the womb of Mary his Mother. Thus, we may well say that our Lord made a nine-month novena with Mary before coming forth from her most pure womb, and so likewise the Apostles made a nine-day novena with May before going forth to preach the Gospel throughout the whole world. However, the general practice of novenas did not gain official approval by the Church (through the granting of indulgences) until the nineteenth century. Indeed, it is quite surprising that the practice of novenas did not gain greater popularity and official support earlier! In these nine days of prayer before Pentecost, we Christian faithful recognize our own imperfection (symbolized by the number “nine”, being one less than the perfect “ten”), but also beg the good Lord to renew within our hearts all the gifts of the Holy Spirit. Thus, the novena to the Holy Spirit is at once an act of repentance and purgation in preparation for the Solemn Feast of Pentecost, as well as act of petition for a new outpouring of the Spirit in our hearts and lives. The Novena to the Holy Spirit begins on the Friday after the Ascension (if the Ascension is moved from Thursday to Sunday, the novena still begins on the Friday following what would have been Ascension Thursday) and continues each day until the Vigil of Pentecost on the next Saturday. The EWTN website has the Pentecost Novena for the Seven Gifts of the Holy Spirit [here] and, in a printable format, [here]. The Novena consists of two prayers said daily, together with prayers specific to each day. It does not take a great deal of time each day, perhaps only a few minutes. 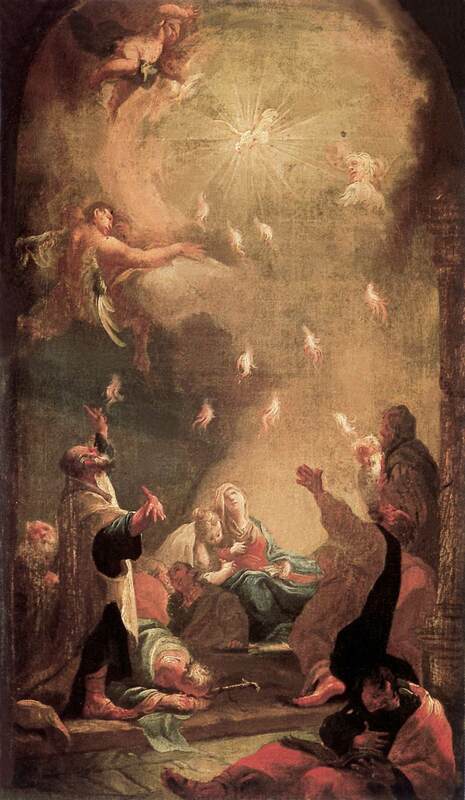 Let us join with Mary and the Apostles as we anticipate with joy the feast of the Descent of the Holy Spirit! Come Holy Spirit fill the hearts of thy faithful, and enkindle in them the fire of thy love! Father, thank your for this much needed post. I always wonder what type of prayer did Mary and the Apostles engaged in during these nine days. Often times I hear Catholics involved in the Charismatic Renewal and Pentecostals argue that they were involved in spontaneous prayer during this time. But is it possible that their prayers were actually formulaic like the OurFather, the novenas we now pray and liturgical prayer? If so, what formulaic prayers could have they used and how similar was it to the Jewish formulaic prayer of the time? Only developed as a latin devotion. It's beautiful practice. What are the pagan parallels? I've tried praying Novenas a couple of times, but I either forget or so wrapped up with responsibilities, I forget a day and that's the end of it. The nine days in pagan life is associated with death ... nine days after a family member's death or after the funeral ... also, nine days would be set aside to remember all the dead. I would imagine that the Apostles and Mary were praying the Our Father and also many of the psalms. Indeed, as you say, it is hard to imagine that the Jewish Apostles would wholly abandon the ritual methods of prayer. Am I correct in thinking that during the nine days of the first Pentecost Novena, and prior to the Descent of the Holy Spirit at Pentecost, Pope St. Peter and the Apostles conducted the important business of beginning the Apostolic Succession by selecting St. Matthias to take Judas Iscariot's vacant position? Also, did the Apostles celebrate the Liturgy of the Holy Eucharist on the intervening Sunday before Pentecost? This would have been the first Mass. When does the Church say the first Eucharistic Liturgy after the Ascension was offered by the Apostles? I'm praying the novena, thank you, Father! God bless you. Yes, it was during these days that St. Matthias was chosen. Thanks for mentioning that! As far as the Mass ... I am not certain. They could have offered the Mass -- for they were indeed priests. But I am not sure whether or not they did. In many ways, it would seem most likely that they did offer Mass together (concelebrating), at least on Sunday. To my knowledge, there is no official teaching on this point. Father, what would be some of the differences between the way the Greeks and the Romans kept nine days in remembrance of the dead and our novena for the dead? I am interesting in knowing the intentions behind their practice. By intention I mean to say did they feel that keeping these nine days was a way to appease the gods? Did they keep these nine days because they felt that their were aiding the soul in thethe afterlife? If so, what wasis their viewpractice of thethe afterlife? Also, what exactly did they pray and what rituals did they engage in during this time? I appreciate any answers or information regarding these questions. It would be helpful to know how to explain to others how our novena for the dead is different from the Greek and Roman nine day observances for the dead. I don't know too much about the pagan practices ... but I will say that the pagan Romans ended up not believing in an afterlife ... their great sin was despair. What do you do after saying the novena for 9 days but your petition is not granted. Do you continue with the novena? @missy, I did the St Jude Novena for the preparation for my exam, and unfortunately I failed. But since I am determined to pass for the exam,I am working so hard and I started again the novena prayers. I know this time my wish will be granted in God's will.